Samsung appealed both of last week's preliminary injunctions (the one against the Galaxy Tab 10.1 and the one against the Galaxy Nexus smartphone, which the Korean company co-developed with Google) to the United States Court of Appeals for the Federal Circuit. Simultaneously with notifying its appeals, Samsung asked Judge Lucy Koh of the United States District Court for the Northern District of California -- the federal judge who had granted Apple those preliminary injunctions -- to stay both injunctions pending appeal or, in the alternative, until the Federal Circuit decides on a stay. 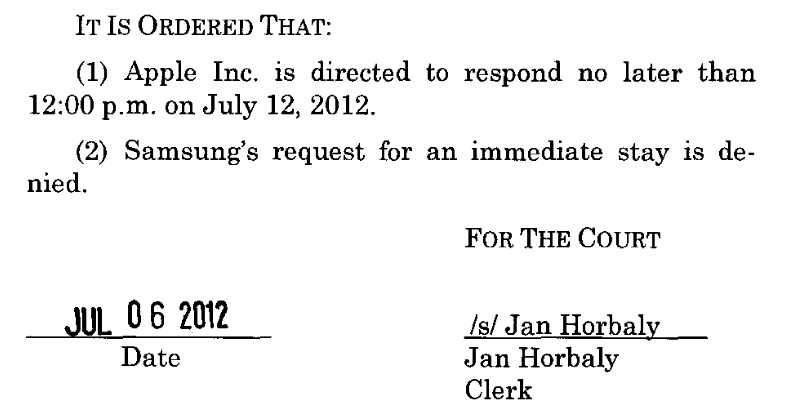 Judge Koh denied both motions to stay in their entirety (Galaxy Tab 10.1, Galaxy Nexus). Earlier today, Samsung asked the Federal Circuit to stay both injunctions -- again, Samsung ideally wants those injunctions stayed pending the respective appeals, but it also asked for immediate stays pending the Federal Circuit's decision on a stay pending appeal. The Federal Circuit has already ordered Apple to respond to both motions to stay no later than on July 12 (next week's Thursday): by noon (Eastern Time) for the Tab 10.1 and by 5 PM for the Nexus. I have not yet studied Samsung's motions in detail. 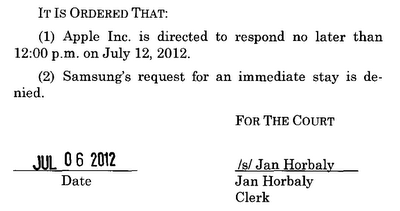 At first sight, Samsung's arguments are the ones its lawyers already made in the Northern District of California. No surprise there so far.